Introductory comment: I have fed my Bull Terrier this recipe and she started to show signs of being hungry all the time. Raising the amount of food did not resolve the situation, as she was super active at that time. I would recommend this recipe predominantly for dogs who do not get lots of exercise or dog who are a little overweight, because it uses lean meat. Dogs who are very active should eat more fat and get more calories. For those dogs I recommend to choose meat with a higher fat content. You will find a lot of comments in my recipe because over time I have gathered some experience and want to share all new information. You will see that this recipe is pretty flexible and can be adjusted to different activity levels and situations of a dog. Here comes my basic recipe for lean, low starch, grain-free raw food, if you want to make your own raw dog food for your Bull Terrier or any other dog. It took us three batches to get to this recipe and figure out the tips and tricks. It will be subject to further evaluation with every new batch we make. This is how we produce it right now. The calculated amounts deliver enough food for up to 45 days for a 45-50 lb dog. I have tried to describe everything as detailed as possible for you. 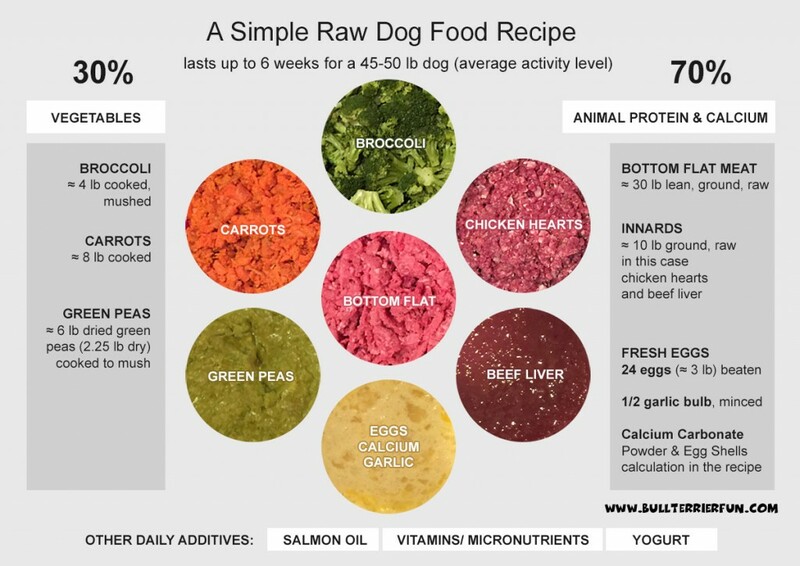 Enjoy raw “cooking” for your dog. As Mila has some problems with yeast, I only chose low starch veggies in this batch in order to avoid feeding my dog AND her yeast. If you don’t have such problems with your Bull Terrier or other dog, feel free to substitute some of the veggies by others. Possible substitutes are sweet potato, pumpkin and lentils, only to name a few. This will also bring variation into the food.